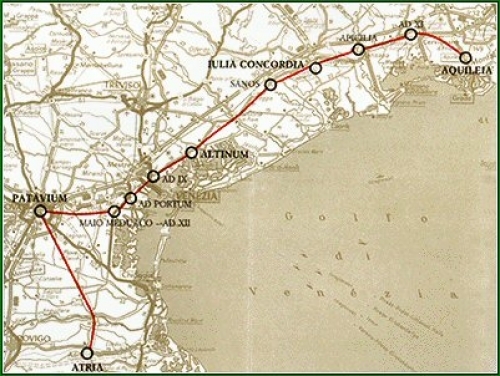 The consular Annia road (131 a.C.) used to go up through the northen woodland coasts from Ravenna to Altino, going ahead on the edge of the old lagoons up to Julia Concordia and Aquileja. North-east of Altino the road went across diagonally Meolo and Musile meeting a territory in which the rests of the ancient Fetontea Forest alternate with the marginal marshland of the lagoon and prosperous areas of coltivation with scattered settlements. The aspect of the quarters, wich in the Roman age used to distinguish the territory of Appia road, are slowly re-emerging from the veil of time thanks to the detailed archaeological researches of the last years. After identifying the layout of the main paved thoroughfare with the help of aerophotogrammetry, the Archaeological Group of Meolo proceeded with the researches in the countryside, made possible by the agrarian levelling effectuated in the area of Mille Pertiche. From these researches is coming out the image of a crowded settlement on the rich farmlands nearby the Appia road. Particularly interesting is the water paleography of this area, completely different from the present, reshaped by the inhabitants, remains proved only by the aereal photography as well as the finding of two new bridges in 1991. Both of Roman age, have been discovered in the territory of Marteggia (suburb of Meolo), west of Fossetta and in Millepertiche (suburb of Musile), east of the same. The bridge of Marteggia was built on a single span that lean on two abutments made of sandstone slabs supported by a number of stakes pounded vertically into the ground. The bridge of Millepertiche, a marvellous engineering work, was located not hortogonal on the river that it crosses; it was built on a single span too and it was 17,5-metre-long and 5,7-metre-wide.